At the 2016 PGA Merchandise Show in Orlando, FL last month, I had several opportunities to see how service issues can inspire new and successful business opportunities. Here are two examples, of two different kinds. Some of the best business ideas come from failure. That is the best explanation I can think of for the remarkable growth of Ship Sticks, only a few years since it began. Coleman decided there must be a better way, and reached out to folks he knew at United Parcel Service. One thing led to another, and Ship Sticks began business in 2011, with a full launch in 2012. The company now has good working relationships with UPS, DHL, and FedEx, with something under 2,000 shipments daily. Compared to the industry’s delivery rate of 92%, Ship Sticks hovers around 98%, providing the service at a significant price discount to other options. That’s quite a lesson learned. “As long as there’s a physical address we can do it,” Skoch said, but the process usually begins online, with the golfer completing a shipping form with the destination and deliver dates. Once scheduled, the golfer prints out the shipping label, and attaches a copy to the prepared bag. If you have a good travel bag for your clubs that will work, but box arrangements can also be made. The clubs (and luggage) can be picked up by couriers or dropped off at the shippers. Golfers can track the shipment online, and an email notification lets the golfer know that the clubs have arrived at the destination. The base charge comes with a $1,000 insurance policy, but higher coverage can be bought for a modest uptick. Resort courses such as Bandon Dunes, Pebble Beach, and Pinehurst work directly with Ship Sticks, so golfers going to those locations can see a Ship Sticks logo and link at the resorts’ website as part of the reservation process. Skoch said that the Company enjoys significant success with the members of many clubs, specifically referring to Rehoboth Beach Country Club. Kings Creek Country Club also works with the company to help its members. The experience of Cape Region clubs with Ship Sticks also speaks to the potential benefits of the word of mouth method of marketing. Sometimes you learn about a Cape Region connection to a golf company in the most direct way possible. I had a morning appointment at the PGA Merchandise Show with Lukas Sanchez of the Mission Belt Company. As I approached the booth, I couldn’t help notice that Butch Holtzclaw and Kyle Deas of The Rookery were already there, putting the finishing touches on an order for the coming season. The two club pros told me they’ve been carrying the Mission line for a while now, and in fact Deas was wearing one that day. Sanchez was obviously pleased about this coincidence, and enthusiastically described Mission’s history and unique business model. Several years ago the founders appeared on Shark Tank, the business investment TV show, and from there the company has enjoyed steady growth. In addition to golf courses, Mission is an official licensee for the NHL, NBA, and NCAA. 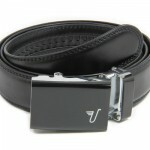 The belts do not use the traditional hole and pin-buckle every inch. 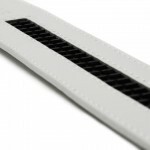 Instead, a flexible plastic gearing strip is sewn into the leather or nylon belts. The interchangeable buckles click into the gears at every quarter-inch, giving the wearer the best chance for a perfect fit—not too snug, not too loose. The belts come in 35mm or 40 mm widths, in a dizzying array of styles, but the truly intriguing part of Mission is “the Mission”. Beginning with helping one man from Panama City, Panama with his plans to start a shuttle bus operation, Mission has made over 32,000 micro-loans to entrepreneurs primarily in developing countries. Sanchez says Mission Belt has a 99 per cent payback rate on this remarkable service to others in need. Under the right circumstances, capitalism is the ultimate charity. Locally, the belts are also available at The Peninsula Golf and Country Club in Millsboro, Baywood Greens, and at Beach Essentials on Baltimore Avenue in Rehoboth Beach.